One of the criticisms I heard most often in the early days of 3D printing was a lack of practical projects. It's taken a few years but we're finally starting to see some pretty clever and functional 3D printed projects emerge. Amos Dudley is no different than many college students in the fact that he's broke. He also wasn't blessed with perfectly straight teeth, something he said left him feeling a bit self-conscious. 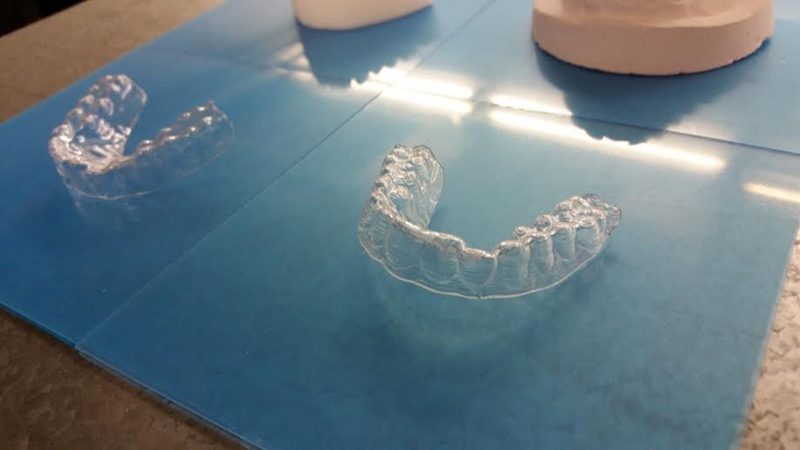 One day while researching brand-name (likely Invisalign) clear orthodontic aligners, he happened upon a picture showing an aligner that appeared to have the same layer striations that 3D printed items exhibit. Intrigued, Dudley wondered what would stop someone who has access to a 3D printer from making their own aligners. As it turns out, not much at all. Dudley researched the professional process for creating clear aligners and realized that as an undergrad, he had – or could acquire – everything that was needed so he decided to give it a shot. For the sake of brevity, we'll skip past all of the technical details here which can instead be found on Dudley's blog. The results speak for themselves. Dudley said he has been wearing the retainers day and night for the past 16 weeks, noting that only the teeth that he desired to move had any sort of noticeable pressure on them. The undergrad said he plans to fabricate a bunch of additional retainers for the current position which he can use in the future to help maintain his now-straight smile. As an added bonus, Dudley found that the aligners double as perfectly-fitting whitening trays when trimmed down a tiny bit. Furthermore, they can also serve as night guards to protect against teeth grinding while asleep.